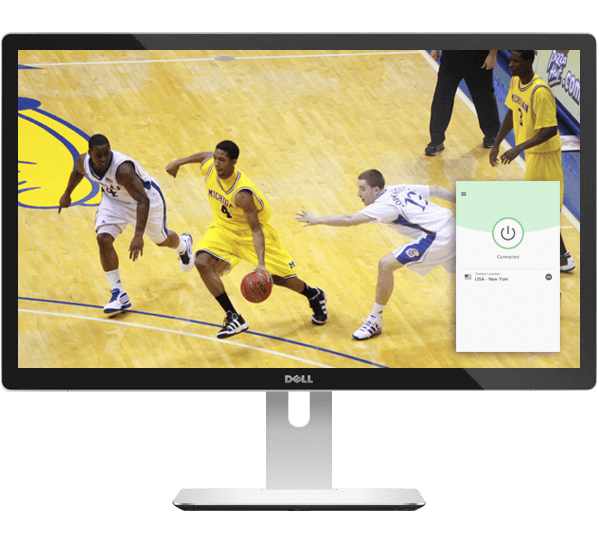 How to stream March Madness online? After the most exciting month in sports, the Final Four is here! Use ExpressVPN to stream March Madness in HD. Watch every moment of the NCAA National Championship game, as first-time title contenders Virginia and Texas Tech face off in a defensive showcase. Catch all of the action with ExpressVPN! … or spending a dime. Select an option below and get FREE streams! The NCAA has partnered with CBS and Turner Sports (through 2032) for March Madness streams. Of the available games this year, 21 will be shown on CBS, while the rest will be available through Turner channels. You can catch all 21 of the CBS games free on the official March Madness Live website. Connect to a U.S. server location. Pro tip: For Windows and Mac app users, use the Speed Test to find the fastest U.S. locations. Watching on the go? Get the NCAA March Madness Live app and don’t miss a moment! The app gives you three hours of free Turner-carried games. Get the NCAA March Madness Live app on iOS or the Android. Pro tip: iOS users may need to change their App Store location to get the March Madness Live app. Tune in to the live stream! 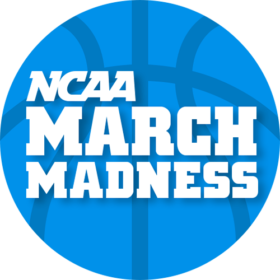 YouTube TV carries Turner sports programming, so be sure to use the service’s seven-day free trial to watch March Madness! Looking for another free option? Use the five-day free trial from PlayStation Vue! Still want another week of free streams? Sling TV is another easy way to tune in to the Turner games! Kick back and tune in! Looking for another way to get free NCAA Tournament streams? Try the seven-day free trial at Hulu. Tune in to the action! Note: All games times below are in Eastern Standard Time. (13) Vermont 69-76 (4) Florida St.
(15) Bradley 65-76 (2) Michigan St.
(13) UC Irvine 70-64 (4) Kansas St.
(11) Ohio St. 62-59 (6) Iowa St.
(4) Florida St. 90-62 (12) Murray St.
Click to view the best March Madness streaming options! By now, filling out your bracket (and watching it implode) is an annual tradition. Download and print out the official CBS March Madness bracket! If you’re looking for bragging rights, go online and challenge your friends in the Official Bracket Challenge. Looking for instructions and tips to improve your odds? Check out the official NCAA Bracket Challenge tips and get a leg up on the competition! How can I watch every March Madness game free? It’s possible, but you’ll have to play it smart. Connect to a U.S. server location. Check out the schedule above. If the game is shown on CBS, use the official free web stream or mobile stream. If the game is shown on a Turner channel, use the mobile stream (no TV subscription needed for first three hours of Turner-carried games) and the free trial options. If you want more stream options, check sites like Reddit for on-the-day streams. How to watch March Madness online in Canada? All you need to do is determine whether the game is on CBS or Turner. To watch games on CBS, connect to a U.S. location and use the web stream. For Turner-carried games, connect to a U.S. location and hit up the mobile stream or use one of the free trial options. No need to call a time-out! If you have any questions, including picking the best servers for streaming, the ExpressVPN Support Team is available 24/7 to help you. Contact the ExpressVPN Support Team for immediate assistance. It may not be a NCAA Championship shootout for the ages, but at least fans of aggressive defense should be happy. Escaping another close call with the help of three last-second free throws, top-seeded Virginia edged past fifth-seeded Auburn to advance to the title game, where the Cavaliers will confront another smothering side in Texas Tech. The Red Raiders made it look a little easier in their Final Four showdown with Michigan State, but the winner on Monday night in Minneapolis will be the team that manages to find just enough daylight to score under withering full-court pressure. It’s the first title game for both teams. So who locks down another first, their school’s inaugural NCAA Championship, and who falls just short at the finish line? Leave a comment below! My VPN is slowing down all of the apps on my computer. When I disengage the VPN everything’s back to normal. I have use disconnect in the past and never had issues like this. Now that I have express VPN and paid for it for the year how do I clear or speed up this VPN so that I can have Spotify and have normal usage of my Internet. I’m trying to watch Kansas vs. Auburn from the UK. I connected to the VPN and tried to access the website in an incognito browser but seems to be blocking me. Please help. If you’re trying to access the NCAA March Madness Live website, please make sure you’ve installed the ExpressVPN browser extension (https://www.expressvpn.com/support/vpn-setup/expressvpn-browser-extension/) and are NOT watching the stream from an incognito browser. I’m trying to watch March Madness from Canada. I tried to get the iOS app like you instructed, but it says I cannot get it from my app store. What should I do? You will need to change to a U.S. App Store before you can find and download the March Madness Live app. Please follow the instructions here (https://www.expressvpn.com/support/troubleshooting/change-app-store-country/) and download the March Madness Live app in step 10 (instead of the ExpressVPN app). Remember to connect to a U.S. VPN location before you watch games in the March Madness Live app! Don’t let that get in your way! Simply connect to an ExpressVPN U.S. location, open an incognito browser with cleared cookies, and you’ll be all set to watch! I’m supporting UCLA. Go Bruins! will the ExpressVPN slow down the speed when connected to other continents servers? It is possible there may be some minor loss of speed when connected to servers that are far from your location. However, ExpressVPN is constantly optimizing server speeds and you can use the speed test function to see which servers are best for your location! i am about to buy express vpn to watch march madness tonight. once I have the app on my macbook pro, how do I find the games? You can visit http://www.ncaa.com/march-madness-live/watch to see which channels are broadcasting the games (some may require a subscription). Just remember to connect to a U.S. server location and you’re all set! I’m in BA Argentina and dying to watch the NCAA tournament; the DSL connection in the apartment is poor and there are no sports bars that can get the games. Do you have service here? How do you stream it? Tried a few times with no luck.